We know it's hard to wait for your new Noonday! 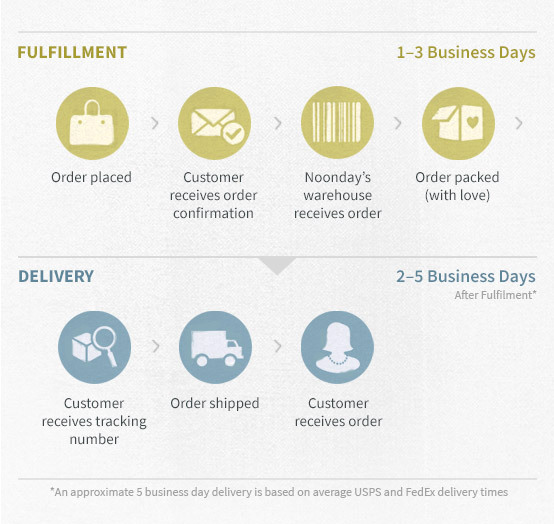 Once your order is placed, you can expect it to ship within 1-3 business days. All shipping options are flat rate, so feel free to snap up that extra necklace you have your eye on! For orders placed through an Ambassador’s Personal Website or on the Noonday Collection corporate website, you may select Standard, Expedited or Express shipping options. All orders placed at Noonday trunk shows are shipped via standard shipping. How quickly will I receive my order with Expedited shipping? Orders placed by 12:00 PM CST Monday through Friday (excluding holidays) will ship out the same day. Orders placed after 12:00 PM CST or on Saturday/Sunday will ship out the next business day. Expedited orders will arrive 3 business days after shipment. How quickly will I receive my order with Express shipping? Orders placed by 12:00 PM CST Monday through Friday (excluding holidays) will ship out the same day. Orders placed after 12:00 PM CST or on Saturday/Sunday will ship out the next business day. Express orders will arrive 2 business days after shipment. We have big dreams for the future, but for now we ship to the US and US APO/FPO addresses only. I want everything! Will I pay more in shipping if I order more? Nope! 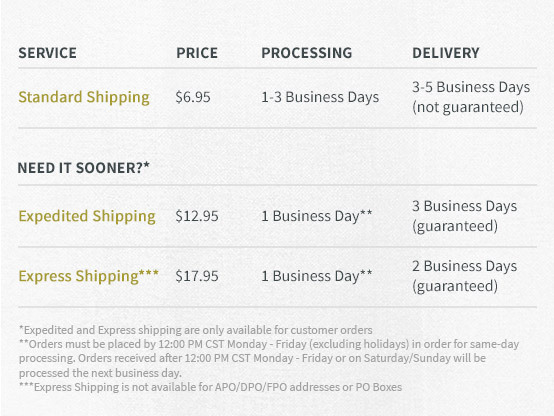 You will pay a flat-rate shipping fee on each order, regardless of how large your order is. How will Noonday ship my order? After you place your order, you can expect your package to ship within 1-3 (may increase to 3-5 days during peak business season) business days of the order placement date. Your order will be packaged with tender loving care and shipped via FedEx, or USPS First Class or Priority mail, depending on the ship to address on the order. When your order ships, you will receive an email from us containing your tracking number and a link to track your order. Once your package leaves our Austin office, it should find its way to your door within 3-5 business days (based on carrier transit times). You will typically be notified that your order has shipped within 3 business days and receive your order within 10 business days of the order placement date. Please note that these processing times may increase during peak shopping seasons. Will my card be charged at the time of purchase, or when my order ships? Your card will be charged in full at the time your order is placed. My item is backordered. What should I expect? There are some spreadsheet-loving team members who do an amazing job of forecasting how many of each piece we'll need here in the Home Office. But once in awhile, an item will take off like a rocket and end up temporarily out of stock. We think this is a good problem to have, but we know you're eager to receive your new goodies! If an item becomes backordered after you place your order, we will reach out to you via email to let you know when you can expect to receive it. But don't fret—all of the other available items in your order will be shipped to you right away! Once your backordered item comes back in stock, we'll ship it out to you ASAP at no extra shipping cost to you.